The process of finding a trusted sitter for your child can be an exhausting and daunting process – if you have experienced the challenge of finding, interviewing and hiring the “perfect” sitter for your child, you are definitely not alone. Millions of families experience what you have gone through every day – which is the reason background checks have become so standard in the search for trusted sitters. It has become almost commonplace when asking about someone’s sitter: “Are they background checked?” It makes perfect sense, we live in a crazy world where you don’t always truly know who a person is. 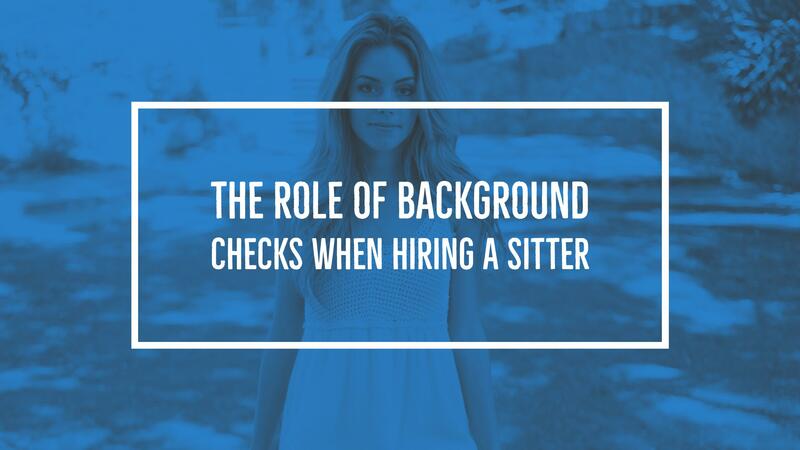 However, families shouldn’t solely rely on a background check to assume the sitter will be perfect for their kids. It is always a good idea to know if there are any red flags from a criminal past, but you can do much more than just rely on a background check. Most “sitting services” be it an agency, website, app, etc. run some type of background check; they all use different 3rd parties to perform these checks, many with different tiers of available checks for you to pay for. But exactly how trustworthy are all of these “background checks” that everybody is selling you? NBC 5 in Chicago conducted an investigation on background checks focusing on two sitting website/app companies, Care.com and SitterCity, and the results will probably shock you. They posted ads on both sites seeking sitters, and sought out 4 applicants who agreed to create sitter profiles on each site and then applied for their positions as part of the investigation. On both websites, the background checks carried a fee, which is usually in the $70-$100 range, sometimes more, depending on how deep of a check you want to run. So, how did things work out? Surprisingly, pretty bad. Three of the four applicants had criminal records, with the fourth having had a few speeding tickets. Out of the 8 profiles created (four applicants, two sites), 7 of them passed their background checks, with approval badges being visible on their profiles. Care.com denied approval to one of the applicants with a criminal record. What slipped by the paid background checks? Possession of marijuana, domestic battery, prostitution, felony assault, amongst other things. Are these fringe cases? Who knows. What is important though, is that families should always do more than rely solely on background checks. It is amazing what can be found by doing a simple google search these days. In a matter of minutes, you can search social media accounts, court record listings, and a myriad of other information sources that can tell you a little more about who you are looking to hire. You can tell a lot about someone in a few minutes of talking to them. It is important that you personally feel comfortable with them. Just because a service has “pre-vetted” all of their sitters doesn’t mean that they are ok for you. Do you personally know the person that did the vetting? Usually not, which is why it is important to take things into your own hands. In an interview, you can ask them point blank about any past issues they have had with the law, or any other questions you may have about their background. Unfortunately, this one is a little easier said than done! Many families don’t like to refer their sitters as they like to think they are keeping them all for themselves. However, the best way to find trusted sitters are from people that you know. If you already have a sitter, but are looking for more, maybe try offering one of yours to your friend in exchange for theirs. This can quickly grow everyone’s pool of trusted sitters. Moral of the story, don’t get too comfortable with background checks, especially when they are being used as a revenue generating tool for many sitting companies these days. Do your own legwork, it may take a little extra time, but it will be well worth it when you can leave the children with someone you trust while you enjoy your time away.